Here at YouFr8 the shortest shipment we do is to our cousins across the ditch. Shipping to New Zealand is very economical and safe but you need to be careful or you could pay too much for an inferior service. You also need to be aware of special issues with New Zealand, particularly the Ministry for Primary Industries who are very strict on checking all personal effects for biological matter. Our self pack container service to New Zealand is very popular for clients that are prepared or able to do a bit more work. 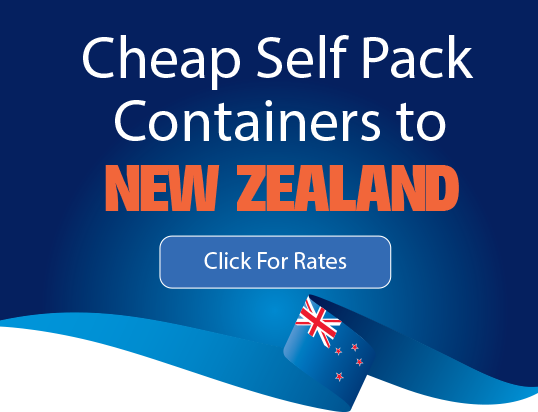 If you are sending a 20 ft container, door to door from certain Australian cities like Brisbane, Sydney or Melbourne to a major port in New Zealand like Auckland or Christchurch, you can save you five or six thousand by packing and loading your own container. If you can access your own packing and loading crew we can get a 40ft container to New Zealand cheaper. By packing and loading your own 40 ft container you can save ten thousand dollars. For more information on YouFr8’s self pack option click HERE. If you don’t have any furniture or your furniture is small enough to fit in a smaller box that one man can carry (under 30 kgs each) we can send through a service called excess baggage or unaccompanied baggage. This is an air freight service. Please click here to get a quote online. Because these goods can be delivered by one man and usually don’t require additional packing they can be sent through very economical delivery channels, that s why if you can keep your shipment within these limitations it is much cheaper to send. Prohibited items to New Zealand? When packing for your goods going to New Zealand you need to be aware of Biosecurity New Zeland. New Zealand is serious about its biosecurity and you need to be very aware of any dirt or biological products on your goods. Biosecurity New Zealand look at every shipment and take special interest in items such as mowers, ladders, camping gear. Check out their website before preparing your goods for transport http://www.mpi.govt.nz/ You also need to be aware of New Zealand Customs regulations, you can read about them HERE. Get an instant quote to move to New Zealand! Shipping to New Zealand is quite quick if it is a direct sailing. We have moved people door to door from Brisbane to Auckland within a week if it is a full container, and the sailing is times well. However there are contingencies and a more realistic time frame for a full container to Auckland is about 2 weeks and up to 3 or 4 weeks to the South Island if the sailings do not line up with packing dates. If you send your goods in a shared container it can take up to 6 weeks. Your shipping consultant at YouFr8 will be able to advise you on this issue. Please fill in your details to request an emailed quote. What will it cost to ship your stuff to New Zealand? Most people when they contact YouFr8 are doing a cost benefit analysis. Will it cost more to ship than it’s worth? Well of course it depends what your goods are worth, but it is very economical to ship to New Zealand. Many of our clients ship quite old furniture or a great favourite is Ikea furniture, which apparently is not available in New Zealand. There are two main ways we ship to NZ, the first is to take your own container. A 20 ft container will hold a small 3 bedroom house. By small we mean, just one lounge room, dining room, outdoor setting and an average amount of furniture and effects. If you have more than one living room, 3 large bedrooms, a study and media room, you would probably need a 40 ft container. A 20 ft container door to door Brisbane to Auckland can be under $5,000 or it can be up to $7,000 depending on the packing services needed. A 40 ft container can be around $10,000, you really need to get a custom quote from one of our sales consultants.